When the all-electric Chrysler Portal minivan was revealed at the 2017 Consumer Electronics Show we had two takes: Chrysler forced a bunch of obnoxious millennial-mobile PR talk into the presentation of a pretty cool car, and it actually made a lot of sense. Well, however you feel about it, you’re about to be feeling it a lot more, as Chrysler is moving the Portal into production. While the Chrysler 300 will finally die in the next few years, Chrysler won’t be forced to survive on Pacifica sales alone, Automotive News reports. 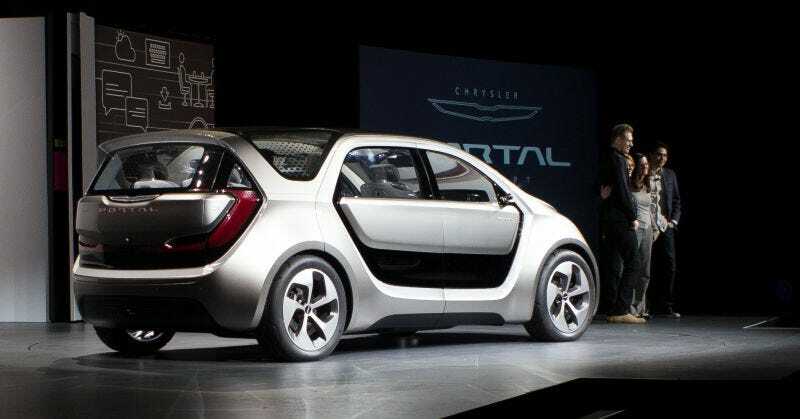 By 2020 a minivan based on last year’s Portal concept will hit show rooms. Back in 2017 when it rolled out the Portal, Chrysler was very insistent on highlighting that this was a concept as designed “by millennials for millennials,” also known as Adult Human Beings. While it was painful to watch Chrysler trying to speak to “Youths” (some of whom are well into their 30s now) the concept was clearly a cool idea. We’re hoping a ton of the quirky concept’s details make it to production, like the 250 miles of range and very neat doors that slid out from the middle to reveal both the front and back seats. While this concept was originally billed as an electric, autonomous vehicle, it seems like the self-driving component has fallen by the wayside. Oh well. Doesn’t matter, as fully autonomous cars will never happen.